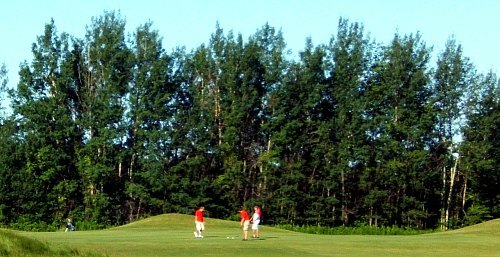 Pipers Glen Golf Course is a cottage country course that allows Fivesomes and has no marshalling. Don't go after 8:00am if you don't want to wait on every shot. Come for the price and the greens and not the scenery. Piper's Glen prime time rate is $50 which does not include range or cart. This price range falls into the A+ rating category but you do sacrifice some quality for price here. The difficulty for this course is too easy. A mid handicapper can play from the tips a easily break 90. Also aside from fescue, there is not a lot of trouble out there. A "C" rating is right for this area. Being situated in middle of a large flat field, Piper's Glen architects didn't have a whole lot of scenery to work with. The out skirts of the course did have a bunch of trees, but you are in cottage country and the trees are barely part of the course itself. The course is going for a links style effect however aside from ample fescue, there is rarely a bunker around the course to decorate it. The bunkers that are there are plain and boring as well. 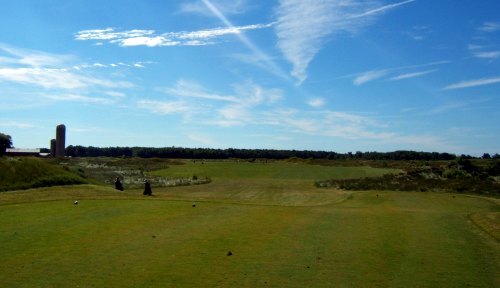 This course is deserving of a B rating for scenery only because there is so much fescue and some bunkers. The green conditions were very good. They were smooth and true and there was very little patchiness. I have to give the greens an A rating as they were a pleasant surprise and were close to A+. Fairway conditions were long and weedy. There was also a fair bit of mud spotting up through the green which I'm not sure what it was caused by. Possibly worm holes. Not sure if they were trying to be ecologically friendly or if they were trying to be old school but there was a lot of weeds in the middle of fairways all over the course. I think a C rating for these fairways is appropriate. The clubhouse had a country corner store feel to it. They do have a restaurant and pro shop but both were very small. I think a B rating is fair and no overly critical. The layout of Pipers Glen Golf Course was pretty amateurish. There was a lot of cutting across other holes to get from one tee box to the next. A few hokey holes and a very flat and straight course in general. There were few bunkers and virtually no water in play to make it feel like you weren't in a farmer's field. 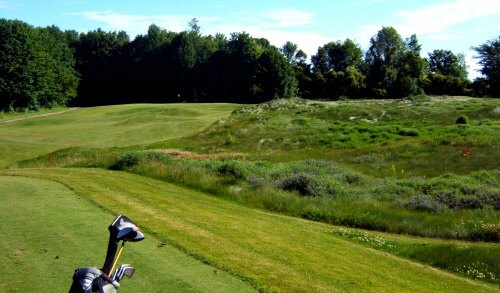 The course rating for this area is a C.
Pipers Glen is found on the outskirts of Port Elgin Ontario. Return HOME from Pipers Glen Golf Course.